In preparation for the hurricane season, the following directives are suggested for the general public in anticipation of a hurricane making landfall. 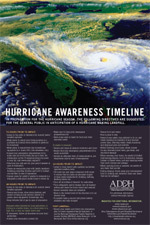 Make sure you and your family are prepared for hurricane season this year. Listen to the radio or television for current news/weather updates. Make plans to secure your living quarters (i.e. purchase and install storm shutters or plywood for windows). Make plans to secure/store any recreational equipment (i.e. boats, RVs, four wheelers, etc.). Inspect your emergency preparedness kit to make sure all of your items are current. For information on the 10 essential items you need in your kit, visit Get 10. Plan how you will care for your pets if needed in case of evacuation. Create an evacuation plan with family members detailing a meeting location and how to contact one another in case of separation. Discuss plans for safety if unable to evacuate (i.e. designate a safe place inside home to reside in). Secure your home, close storm shutters, and secure or bring in any outdoor objects (i.e. plants, lawn equipment, furnishings, etc.). Keep vehicles fueled in case of evacuation. Listen to local news/radio updates via battery-operated weather radio. Fill bath tubs and large containers with water to ensure you have an abundant supply of clean water available for drinking, bathing, flushing toilets, etc. Turn off all utilities if directed by authorities. Turn refrigerator and/or freezer to its highest setting and leave the doors closed and secured. Ensure essential items are available. Move to the lowest level of the structure or to an interior room. If possible have a second cell phone battery available and fully charged. Ensure your safety and follow your evacuation plan to locate separated family members, or use the National Emergency Family Registry and Locator System (NEFRLS) or the American Red Cross. Return home safely once advised to do so, and while traveling be watchful of any downed power lines, standing water, weak structures, and displaced pets and wildlife. Before entering your home, check outside for any downed power lines, gas leaks, and structural damage. When entering your home, be careful of shifted furniture/appliances, roof or foundation damage, broken or frayed wires, and any standing water that could contain raw sewage. When opening doors or cabinets, be careful of any items that can fall. During cleanup, throw away any contaminated food or clothing and disinfect/clean any items that can be salvaged. Evacuate when directed by local authorities, or if living in a mobile home, on a flood plain, in a high-rise building, or near an inland waterway. If evacuated, follow all directives by your local authorities. Initiate your evacuation contact list. Bring your emergency preparedness kit. Have cash on hand for food and other essential needs. Secure and brace all exterior windows and doors. Ensure your emergency preparedness kit is easily accessible. Initiate an alternate form of communication - use telephones only in case of emergencies.